Can't these two ever find common ground? Via Insty, who-- in case you couldn't get enough of the drama from last night-- has this poll. I pulled a Barack and voted 'Present'. After all the finger pointing and circular firing squads from last night, here's something everyone can enjoy. Making fun of liberals. Hey, I think I beat Doug to this. That's a first. Is Boehner's Plan The Best We Can Do? let's examine the history here. Cut, Cap and Balance is dead. Ryan's plan is dead. Boehner's plan will be DOA. The CBO scored the plan light on cuts in the front end and heavy on the back end. In the ten year time span where it won't matter anyway. Because all of those other ten year, eleven year, twelve year plans in the past have been so successful in cutting the existing deficit. Oh, right. Regardless of who leaves the bargaining table first, the Republicans are going to get the blame. More specifically, the Tea Party Republicans. Ideally, I would like to see variations of the CCB bill passed and sent to the Senate. Make the Senate Dems "the party of No" for once. But that would depend on the Republican leadership being able to put forth a coherent narrative and a spine. So no dice. It's going to come down to a game of chicken. I honestly believe that Obama doesn't care if the Nation defaults on it's debt or not. Boehner does so he'll cave first and give Obama what they want. A budget with lots of democrat input. In which case the TP Republicans in the House won't be necessary for passage. This is the hill to stand on. Not next year because it will always be 'next year, we'll fight'. The Republicans have the House but they can't do anything over fear of not gaining the Senate. If they win the Senate they can't do anything over fear of losing the Presidency. If they have both houses of Congress and the White House, they can't do anything at all because then they might loose it all. This is the hill to fight on but it's also prudent to prepare for the worst. Downgrading of the US's credit rating which will affect interest rates, mutual funds and inflation will kick in. Not because of the Tea Party Republicans but because the Senate will accept nothing else but a blank check from the House. But somehow it's the TP Republican's fault for not partisapating in Kabuki Theater. Of course, any bill acceptable to 218 House Republicans may be impossible to get approved by Harry Reid’s Democrat majority in the Senate. So why is there the white hot heat for the TP Republicans that John McCain demonstrated? I'm sick and tired of conservatives being the scapegoat of very thing bad to the point where backstabbing bastards like John McCain feels the need to give out Democrat talking points. The only thing I can think of is because they are voting the way they said they would vote. To cut spending. The Speaker's plan seems to indicate the 'business as usual' that Congress always does instead of actual cuts. Business as usual is what got the Republican party almost beaten to obscurity. It was, in large part, the Tea Parties that got the Republicans back to where they are today. Boehner needs to be kissing their toes not telling them to get back in line. It's simplistic but the Republicans don't want a default on the Nation's credit rating but Obama has signaled time and time again he's not going to work with any Republican unless they agree with him. Going back to, "I won". It's not going to change now. And somehow this is the TP Republican's fault. Smitty-- XO over at The Other McCain-- is now a father to the world's smallest blogger. On the eve of a House vote, new cost estimates from the Congressional Budget Office could pose a problem for Speaker John Boehner as he tries to rally conservative support for his two-step plan to raise the federal debt ceiling and avert default next week. The first installment of $900 billion is contingent on enacting 10 year caps on annual appropriations which the leadership had hoped would save well over $1 trillion. But CBO late Tuesday came back with a report showing the legislation would reduce deficits by $850 billion when measured against the agency’s most current projections for spending. At one level, Boehner is the victim of his own success, since that same baseline is $122 billion lower in direct spending because of concessions the speaker won in the April government shutdown fight. But that won’t help him much with restless conservatives and this could force him now to readjust the bill with tighter caps to meet his goals. And as with most ten year budgets, is meaningless after the next election. Secondly, it's not even a cut but a reduction in proposed spending. That's saying that I'm going to McDonalds for a Quarter Pounder but settling for a plain cheeseburger. When everyone else is saying I need to PB & J it at home. But I'm working on the rest of my project. It's going to be called, "Weinus and Wu-Head". About Anthony Weiner and David Wu and their zany antics. Lance at the Troglopundit has the photo in question. He's a good guy. He links me when I send him stuff on the "Hey, look at me" emails so I try to link him back when he sends posts my way. Question For The Day: Are "Gun Free Zones" Really Really “Target-Rich Environments”? Long answer: Still a yes. It doesn't take a Great Dane and a handful of meddling kids to figure this one out. Whoever the shooter is, he's going to want to shot as many people as possible and at the same time, create terror in those he's not shooting in the hopes that they wouldn't act against him. When someone starts to shoot back, it takes the 'fun' out of it. The Problems That Come With What's Considered "Electability"
Not to rip open old Mike Castle/Christine O'Donnell wounds and rub salt in them. This does not concern them. Well, just a little to help set up some context. It is more along the lines of declaring a certain candidate unelectable and focusing on the one that is 'electable'. A rift that I think will be forming here in Virginia with the primary between Jamie Ratdke and George Allen. More often than not, the 'electable' candidate is the one who sells out conservative interests for votes. Mike Castle is the easy pick to demonstrate this example. Many of the issues that matter, he would vote against. Cap and Trade. Abortion. Illegal Immigration (I'm going with my gut on this one because I can't remember for sure but I think it's a safe bet). Is there any indication in this guy's past to show that he would vote the right way when it would come to something like repealing the incandescent light bulb ban? No. But yet I was told to shut up, get in line and be happy that a "Republican" might win. How is electing a quish of a Republican like Mike Castle going to turn back the wheels of an ever increasing federal state? The same thing is happening in Virginia. Jamie Ratdke is running for Senate, same with George Allen. People are saying that Ratdke is unelectable right out. One such person is my friend Beth (not a strawman. Or strawwoman). Ratdke is to the right of Allen but people say she's unlectable. Let the primary do it's job and see who wins then. I'm not blind to the fact that we need a lot more Republicans elected to the Senate to undo anything of importance but if more Scott Browns are elected who do vote for crap like the Frank/Dodd Regulatory bill, what's the use? Someone said this in the comments over at Spade's shack (can't remember where) but it went something like: Need enough Republicans to win the House. Need enough Republicans to win the Senate. Need enough Republicans to win a veto proof Congress and to win the Presidency. And to keep that way they can't do anything controversial. Conventional thinking like that does not repeal light bulb bans. Short of a Great Communicator emerging, I don't see the answer. When students shell out a six figure income for a low five figure job, something needs to give. A New York Times profile last week described Courtney Munna, a 26-year-old graduate of New York University with nearly $100,000 in student loan debt -- debt that her degree in Religious and Women's Studies did not equip her to repay. Payments on the debt are about $700 per month, equivalent to a respectable house payment, and a major bite on her monthly income of $2,300 as a photographer's assistant earning an hourly wage. And, unlike a bad mortgage on an underwater house, Munna can't simply walk away from her student loans, which cannot be expunged in a bankruptcy. She's stuck in a financial trap. Some might say that she deserves it -- who borrows $100,000 to finance a degree in women's and religious studies that won't make you any money? She should have wised up, and others should learn from her mistake, instead of learning too late, as she did: "I don't want to spend the rest of my life slaving away to pay for an education I got for four years and would happily give back." Four years, a degree that would pay off squat and a grand in debt. Just starting out in life. Maybe Underwater Basket Weaving would have been a better choice. My name’s Ronnie Bryant, and I’m a mine operator. I’ve been issued a [state] permit in the recent past for [waste water] discharge, and after standing in this room today listening to the comments being made by the people…. [pause] Nearly every day without fail — I have a different perspective — men stream to these [mining] operations looking for work in Walker County. They can’t pay their mortgage. They can’t pay their car note. They can’t feed their families. They don’t have health insurance. And as I stand here today, I just … you know … what’s the use? I got a permit to open up an underground coal mine that would employ probably 125 people. They’d be paid wages from $50,000 to $150,000 a year. We would consume probably $50 million to $60 million in consumables a year, putting more men to work. And my only idea today is to go home. What’s the use? I don’t know. I mean, I see these guys — I see them with tears in their eyes — looking for work. And if there’s so much opposition to these guys making a living, I feel like there’s no need in me putting out the effort to provide work for them. So as I stood against the wall here today, basically what I’ve decided is not to open the mine. I’m just quitting. Thank you. Video: Is Obama Channeling Carter? Sure Obama gets compared to Carter often. There shouldn't be any wonder to the 'why'. He hits on some good points about Maher. That he's a coward who sits behinds the comforts of his studio audience and makes jokes from low hanging fruit. And by low hanging fruit I mean tired old cliches that have been trotted out for the last 30 year or so. Possibly longer. In fairness, it's not really Maher's fault. With a face like his, even his mother wouldn't love him. See, that's low hanging fruit. Saying he's ugly. This might be a tad better. Hugh Hefner found his last girlfriend when she had the choice to hang out with Hef and Maher. She picked Hef. A follow up to Allen West's email to Debbie Wasserman-Schultz from yesterday. Rep. Allen West (R) said he had no plans to apologize to fellow Florida Rep. Debbie Wasserman Schultz (D) for a strongly worded email he sent to the congresswoman. I think it was a caller to Rush Limbaugh yesterday who said that it would make a great visual if all the Tea Party Freshmen women in the House make a 'Stand With West' statement or something like that. Rather than have the Republican leadership leave him hanging in the wind. This blog is in the Weekly Spotlight at the Eye of Polyphemus. To paraphrase Joe Biden, this is a big frakking deal. If you haven't checked out Jamie Jefford's blog yet, it's a must read. Especially for Trekkies as he has gone through the entire Star Trek: Voyager series, reviewing them one by one. He's done the same with Star Trek: Deep Space Nine for those die-hard fans as well as political commentary. U.S. Rep. Debbie Wasserman Schultz, D-Weston, headlined a protest march Friday outside the Deerfield Beach campaign headquarters of Allen West, the Republican candidate in a neighboring district. She charged that West, who is seeking to unseat U.S. Rep. Ron Klein, D-Boca Raton, is associated with vicious, degrading attitudes toward women. The evidence: A West-written column that appears in a biker magazine called Miami Mike’s Wheels on the Road, which calls itself the “South Florida Biker’s Bible.” The publication which contains many racy pictures, and even more racier words, lists West as a contributing writer. So it's personal to her. No matter what her reasons, she waited until he left the assemble before she all but named him in an dishonest smear. Not just smears but regurgitated talking point after talking point. Rep. West also has my next bumper sticker slogan: I must confess, when I see anyone with an Obama 2012 bumper sticker, I recognize them as a threat to the gene pool. Update: Linked by the Camp of the Saints. Update II: Donald Douglas at American Power has Debbie Wasserman-Schultz Alfred E. Newmann-atized. Needs to be seen to be understood. Ben Smith has the full e-mail. Interesting enough he describes West as a Tea Party freshman but fails to describe Wasserman-Schultz as a progressive or liberal or anything like that at all. Smith also tries to taint West's email with the word 'Tirade' in the title. It didn't seem like a tirade at all but a well reasoned and thought out response to lying, backstabbing coward that is Debbie Wasserman-Schultz. Now he's just shooting fish in a barrel. Please be sure to read the entire report. Over and over again this is what happens in bureaucracies. There are the paper "rules" that exist in the employee handbook and are entirely hypothetical and notional, and then there are the actual rules for conduct which everyone knows, the rules for keeping your job and not getting hassled and not making the decisions or exercising the judgment you are (supposedly) hired to make or exercise. We saw this with Major Hassan's superiors. The paper rule was that people exhibiting psychological problems and inability to perform their jobs properly were to be demoted and/or sent for counseling and/or drummed out of the military entirely. The real rule was "overlook Muslim weirdness because otherwise your career might be stunted or ended." Bureaucrats respond to the real rule, not the paper rule. And it's plain what the permanent DC bureaucracy has established as the real rule. The permanent DC bureaucracy and liberal media will claim this woman was just "poorly trained" and "one bad apple." Nope. If only. She was trained in the paper rule and then was trained, by day to day operation, in the real rule: Just help people scam the government. Because if you deny someone benefits, you have a person willing and eager to file a complaint against you. But if you help someone defraud the government, there will be no complaint. Because the only person in a position to complain won't complain, as they're engaged with you in a conspiracy to defraud the government. Everyone wins, except, of course, the taxpayer, who's paying for con artists and incompetent bureaucrats who refuse to do their jobs. But the taxpayer is never in the room, is he? Except, once in a while, he is. He's going to spend some time in Iowa. I want to invite you to what will be a great event coming up next week to help Congressman King prepare for his tough re-election battle against former Iowa First Lady Christie Vilsack. New Jersey Governor Chris Christie will be in Iowa, and will be a special guest at a fundraiser honoring Congressman King. Iowa businessmen Denny Elwell and Bruce Rastetter are the co-hosts for the event, and the event will take place at Mr. Elwell's home in West Des Moines. He's reiterated many times in the past that he's not planning on running. Now, I think he's just teasing everyone. I don't like using the word, 'Crisis' because the debt problem was too obvious for too long to too many. 'Crisis' are buzzwords many politicians like to use in order to pass things they normally can't during normal times. But the people who caused the crisis are trying to fix it. Which in any other scenario would appropriate except this is the US Congress. f you have been getting information from the mainstream media you may think tea partiers are forcing Republicans in Congress to; cut the budget so much people will be forced to push grandma’s wheelchair off a cliff or, are trying force the country into default guaranteeing Obama won’t be reelected. Not true! It’s all about not having too many mouths to feed. The debt ceiling’s the congressionally approved amount the federal government can borrow. The ceiling is currently set at $14.294 trillion. The country’s debt hit that figure on May 16 and we are currently approaching $14.6 trillion in debt. Thanks to some “re-arranging,” the Treasury Department says we won’t “run out of money” until August 2. The debt has become a big issue, not solely to the tea party but for the mainstream voting public. Sherlock Holmes 2: A Game of Shadows. The first one was fine as a stand alone movie but had the set up as a franchise. Nice to see it's moving ahead with the sequel. Before his reappearance on Current TV, Keith was kind enough to document his journey of self discovery and enlightenment. Obviously, it was for naught. But I'm leaning that it was at least past 10 in the morning. So drunk it is. It may get her through the day but it's no way to go through life. They should but they won't. It's a little over 9 minutes long but it goes by fast. The video does beg the question: Just how far do environmentalists want to roll back technology? And don't say 'Green' because the cost and availability is still prohibitive. Not to mention unreliable. But what standards to they want the US to go back to? Didn't think candles would be used a replacements for light bulbs. Readers will note that this ad was produced by the Republican National Committee, and was released Monday on YouTube where, as of 3 p.m. Wednesday, it had been viewed 307 times. I didn’t see the video until it was Tweeted by my friend Opus 6, a self-described “soccer mom” in Orange County, Calif., who has 3,716 Twitter followers and posted the video on her blog, American Perspective. You might suppose that I would have been alerted to this new RNC video by the RNC itself. But while I get e-mails from Democrats like Debbie Wasserman-Schultz — and from every random dude with an Internet connection who is trying to promote anything to do with conservative/Republican politics — I never get anything from the RNC. This isn't that big of a blog-- yet-- but I'm on enough lists were people know I'm a blogger and am sent enough "Notice Me" emails from them where blogging is easy some days. But after going through my old emails, there was nothing from the RNC asking to watch this video. The weekly form letter asking for money, sure. A messaging asking all their readers to send out that video? Nothing. So much for the Army of David's approach. Unless you're planning on voting for Janice Hahn then her vote is Wednesday. Turn Right has more of the details about Hahn and how she pissed away millions of tax dollars. That no one who believes in free speech should ever support a politician who resorts to purchasing the local media, death threats, hackers, “Cease and Desist” letters, intimidation, and thuggery to hide her sordid past and criminally incompetent mismanagement. The more I find out about Janice Hahn, the more it's apparent that she needs to be kept out of office and away from any kind of political power. Thanks to Stacy McCain who has more about the story. “Eat Your Peas” Government is a euphemism for the Nanny State, for the government which assumes that the great bulk of citizens are simply too childlike or stupid to be able to be trusted to make their own decisions about… well… anything. William Safire famously referred to 1988 Democrat presidential candidate Michael Dukakis as an Eat Your Peas politician for being such a scold, and the term stuck. The mask hasn't just slipped but has been removed for some time now. This is a bit old but the first I've seen it was the other day. Throughout the WeinerGate ordeal, it was always confusing to me why he was hung out to dry. Usually the MSM wagons come out to put up an impenetrable circle around the democrat until the scandal blows away. As the case with any Democrat, it comes down to money. Weiner is known as a lone wolf in the Democratic caucus and has a history of failing to pay his dues to the Democratic Congressional Campaign Committee. Members are required to contribute based on a scale taking into account factors like time in Congress, whether a member is in leadership and the lawmaker's campaign needs. Failure to pay greatly annoys the party's leadership, which counts on the funds to help members and candidates in tough races. Weiner, now a seven-term incumbent, has been assessed $200,000 in dues for at least the last two election cycles, according to DCCC dues sheets provided to The Hill. In 2010, as his party was bracing for a GOP wave, Weiner had paid only $15,000 by mid-September and he’d raised only about $56,000 for the committee out of his required $250,000. Weiner did, however, bring in almost $200,000 for members in the Democrats' endangered incumbents' program. Weiner was a blowhard who made the blogosphere rounds because of his outbursts but that wasn't enough for the much needed support from the party leadership. It's obvious by now that Weiner was out only for Weiner. Something odd but yet interesting for Friday night. Earlier this month, it was reported that the Kaukauna School District in Wisconsin went from a projected deficit budget to a surplus. The Tech Guy has more. It's obvious I have kids because the movies in question are Kung Fu Panda 2 and Cars 2. Kung Fu Panda 2 has been out in theaters for a while now but this last weekend was the first chance I had to take my kids to see it. But before I get too much into it, a word about what I've noticed about Dreamworks Animated movies in the past. Too often (The Shrek franchise notwithstanding) their movies have been just a bunch of random, quirky characters put together and stirred. Nothing much by way of a storyline. The Madagascar flicks come to mind especially. That seemed especially guilty of "Hey, we got to have these guys do something to fill an hour and a half". That being said, I completely expected the first Kung Fu Panda to be along those same veins. So I was surprised when it turned out to have a coherent plot, a multi-tiered story line with themes of revenge, acceptance and redemption. With a few fat jokes and slapstick as well. There's violence thrown in there-- hence the PG rating-- but what would you expect from a movie that had 'Kung Fu' in the title? And a little bit of mysticism as well but not anymore than the original Star Wars trilogy. If that helps to you something to judge it by. Also, My wife and I hold Pixar movies to be the gold standard in animated movies. There is the rating system for Pixar movies then that for everyone else. The first Kung Fu Panda movie shattered that glass ceiling in my opinion (How To Train Your Dragon is another one that was well made. Someone must be taking storytelling lessons over there). Oh yeah. Stick with the credits to the end of the movie for a little gem. Fast forward if you want but it's worth it. Back to Kung Fu Panda 2. Po (the panda) is back for another adventure. It's the rule of sequels. Bigger and more. This time they go on a quest to Gongmen City to stop Lord Shen (voiced by Gary Oldman) from taking over China with a brand new weapon-- so powerful that even kung fu can't stand up to it. Along the way Po finds out about his past. Something that everyone else seems to know about but him. The sensationalized violence is there but again, what would you expect from a movie with 'kung fu' in the title? And about the same amount of mysticism as well. My issue with the violence is that there isn't any set standard for repercussions from the fighting. Early one, the character of Master Rhino is shot and killed by a cannon round. Later, Po is shot by a cannon as well but survives. Other than Po is soft and was able to absorb the impact of the round much better than a hardened warrior such as Master Rhino, there really wasn't much of a reason why one cannon round killed and the other didn't. The movie is enjoyable and funny and stands up to the first one. There weren't as many fat jokes in this one. Due to the fact that Po has become the Dragon Warrior. There are more than enough about how Po isn't quite the hardened warrior as everyone else is but that plays into his strength instead of his weakness in the end. I would give it 8 out of 10 stars. It seems that every time I see someone rank the Pixar movies, Cars is always towards the bottom of the list. And 'Merchandising' seems to be the reason why more often than not. Which is okay by me. I'm not sure what their financial situation is right now but I think they are one of the few studio's that is doing well. If merchandising and licensing their intellectually property puts them in firm financial footing where they can make more movies like 'Up', that's fine by me. That being said, Cars 2 was a disappointment. It entertained the kids but there wasn't any heart to the movie. And it have a very different tone and narrative than the first movie. It fell more along the lines of a Dreamworks movie where they throw a bunch of characters in a blender and hit spin. Lightning McQueen is challenged to a world wide grand pix of sorts sponsored by an eccentric billionaire, Miles Axelrod. Meanwhile, Mater gets mixed up in a case of mistaken identity of international espionage involving the World Grand Prix. One thing that did make me visibly cringe was that one character said something about, "Once big oil, always big oil." If only for the reason that whenever I hear moronic leftists protest anything, it's big this or big that. Anyway, I have no idea if this was done because it is accepted to be the politically correct thing to do or if it was because Pixar is nothing but a bunch of dedicated leftists to their core (Please, please let it be option one). The other thing that surprised me was the amount of violence the movie contained. Several instances of characters yelling out, "Kill him!" and several scenes of car crashes and apparent deaths. Yet this was rated G instead of PG. The only thing I can think of was that this was Pixar movie and not made by anyone else. Overall, an average movie from a studio that usually delivers much better. Rating it a 5 out of 10. Wait for the DVD is you need to see it. 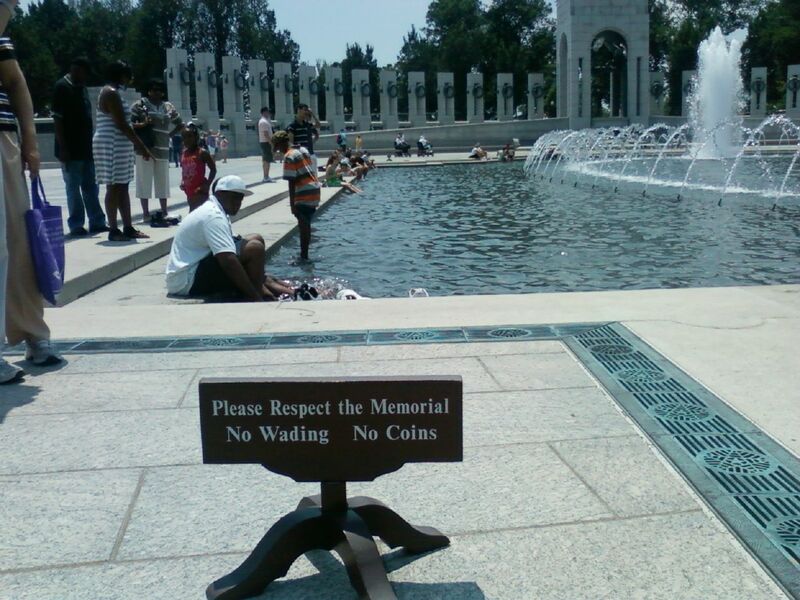 Is This How The World War II Memorial Should Really Be Treated? It was a hot day out at the National Mall but that should still be no excuse to dip your toes in the WWII Memorial. The New Green Enemy Is. 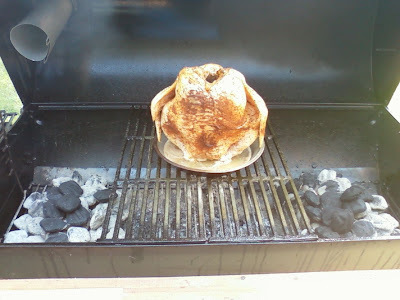 . . Backyard Grilling? For the love of Pete (Link to the New York Times. Fair warning). FOOD is responsible for 10 to 30 percent of global greenhouse gas emissions. By many estimates, cooking represents more of a meal’s carbon footprint than transport. For certain vegetables, it accounts for more emissions than agriculture, transport and disposal combined. Fourth of July, the national celebration of combustion, presents an opportunity for atonement. Consider potato salad: a pale mixture of boiled potatoes and mayonnaise that is sometimes appetizing but always wasteful. An overwhelming majority of the energy in boiling goes into heating the water rather than cooking the potatoes. Now for the burgers and dogs. First, a green disclaimer. Beef is an environmental disaster, no matter how you cook it. 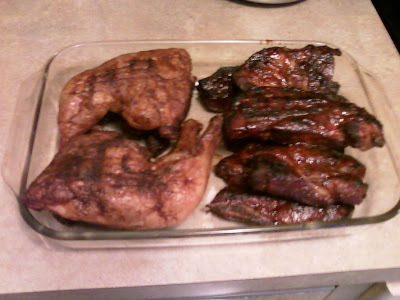 However, if you can’t resist grilled cow, your big decision is between charcoal and propane. It starts here. Then some more people will pick up on this and eventually make it's way into the city or state legislator. 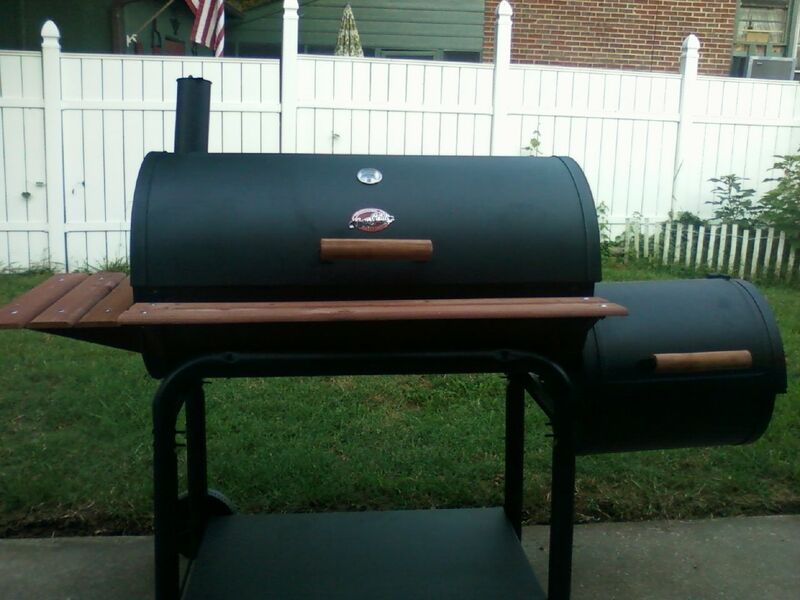 A bill will be presented requiring permits to buy grills. For the good of the planet, it will be explained. New York City tried to ban salt in prepared foods not too long ago. Would a ban on grills be that far fetched? But because liberals are really tyrants at heart and 'Going Green' is merely another way to control you life, your diet and your habits. I also have several slabs of ribs needing to be smoked and a pork shoulder waiting to be cooked low and slow so I would imagine that the carbon offset from those will be huge. What are you grilling up for this holiday weekend? Smart budgeting ends up with extra money for the schools. Imagine that. The sky didn't fall down in Wisconsin after all. Cost savings from worker contributions to health care and retirement, taking effect today as part of the new collective bargaining laws, will swing the Kaukauna School District from a $400,000 budget deficit to an estimated $1.5 million surplus…. The district… plans to hire teachers and reduce class size.Let’s stop and think of all the protesters who carried signs asserting that their opposition to Scott Walker was for the children. It's a mystery for the ages. Right up there with womens obsession with shoes.